Sometimes it can be overwhelming when learning the tango to remember everything. Here are ten tango tips that will help you focus, and get you started like a pro! Having the right shoes on while you are dancing is essential. The last thing you want to be thinking about, when there are so many other things to be concentrating on, is your shoes. Men should have flexible shoes that are comfortable and grip the floor, but also have a little slide to them. Women should wear tango heels or dance shoes. Do not wear shoes that slip on or have an open back. Leather or suede soled shoes are the best. The music is your guide on the dance floor. Find the beat and follow that rhythm, or pay attention to the melody and use that to guide your steps. Don’t feel like you need to rush. 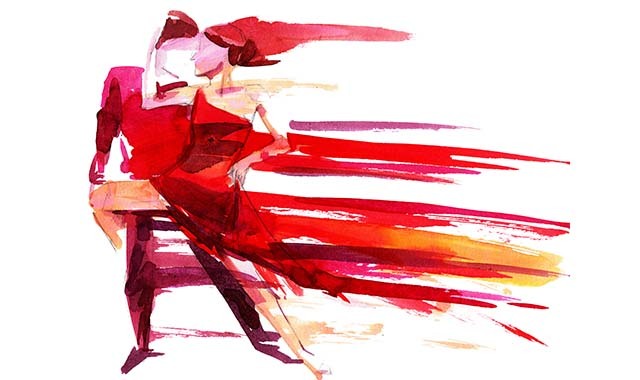 One of the most significant differences between an Argentine dancing the tango and someone from the US is that the Argentine moves slowly and takes their time. This gives the dance the smooth characteristic that defines the tango. Both partners should keep their weight forward over the balls of the feet when facing each other. The bodies should make an inverted V shape. Each partner is responsible for their weight and should match tension and pressure of their partner. This is especially important for the follower to remember as the leader usually sets the tone for the amount of tension and pressure in a dance. 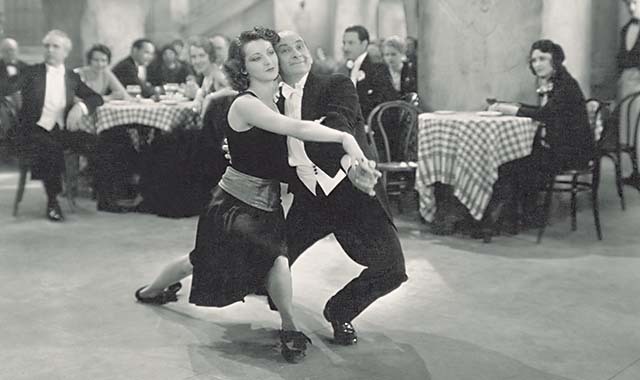 In tango, the majority of the movement takes place below the waist, while the upper body remains relatively still—but not stiff. Arms shouldn’t move independently of the body. Followers, do not hang on to the leader, support your own arms. Dear leaders, while it might be tempting, don’t hold your partner too tightly. Each partner should have freedom of movement, which will allow for better dancing. The leader should hold the follower securely but give them the freedom to move—leading, not forcing the follower into the step. The follower should relax into the embrace and feel each intention of the leader’s lead but know their own axis. It must always be a two-way experience. Completion of a step should take place at the end of the beat. As you complete each step, transfer your weight to the other foot before beginning the next one. Once the step is completed, move on to the next step. Use a normal stride—don’t make it too long OR too short—and keep your knees soft on each step. For the leader, steps should be taken with the heel and then the toe. For the follower, steps should be taken with the toe and then heel when moving backward. 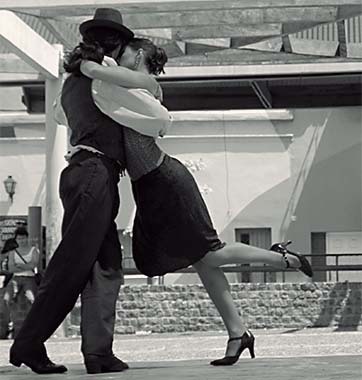 The tango was created to be danced in a close embrace. Because of the inverted V shape made by the dancers, the first point of contact is with the chest. Leaders should look over the follower’s right shoulder, and the followers should look at the leader’s head or slightly to the left or right. If you decide to touch heads, it should be a soft connection that is maintained for the length of the dance. You are not dancing alone; remember this posture helps you stay connected at all times to your partner. 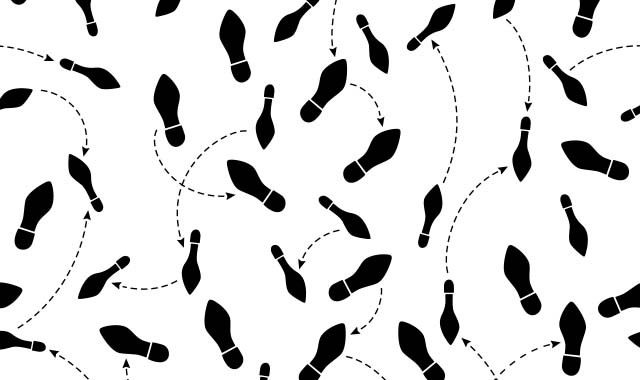 Don’t stay in one place while dancing and always move in a counter-clockwise direction as you move around the floor. Don’t cut through the middle, meander, or stay in the same spot the entire time. The good dancers will stay to the outside of the circle while the beginner dancers get pushed to the inside of the circle. A good rule of thumb is to dance a non-traveling figure followed by a traveling figure as the space in front of you opens up. Never pass anyone on the dance floor, stay behind the same couple you started behind throughout the whole tanda. Followers, don’t anticipate moves. Stay in the moment and follow the lead as you receive it. One of the best aspects of the tango is its improvisational style which leads to being present at all moments. The follower is just as important to the dance, and as responsible for the outcome as the leader, so add your own style and embellishments as you feel it. Keep the body straight, the head up, chest lifted, shoulders and elbows down, core strong, and the leader’s left arm back. Maintain tension throughout the body—if you are too relaxed, you won’t be able to lead or follow. Find a nice balance of tension and relaxation in the body. Knowledge of a lot of steps isn’t necessary to bring your own personality into the dance. Leaders remember to be confident in your steps, and your lead. Followers should also be confident. Do this by following the lead that is given but putting your own spin into the execution. 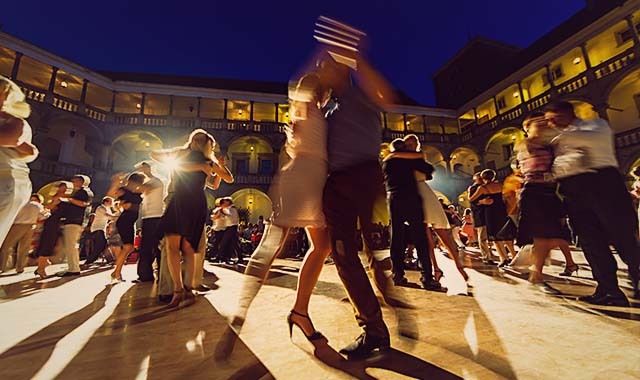 The tango is a conversation, and each person plays a vital role in where that conversation goes. Angel Prince has been dancing since the age of three and has explored many styles of dance over the years. She has built a successful brick and mortar school of dance and performing arts and a non-profit professional dance company. Angel has an undergraduate from Hofstra University in New York and masters degree in dance from The National University of Art in Buenos Aires. Her love of travel and dance has taken her around the world, dancing, teaching, and performing. In a nutshell—her life is all about dance.